Development of the first all inclusive play space for the south east of Victoria is the swing of things in Casey, with the vision for the facility unveiled on Friday. Members of the community gathered at the future site of Livvi’s Place at the Marriott Waters Reception Reserve on Friday to celebrate the unveiling of the dream vision for the play space. Three cheques from MediBank Community Fund, Pakenham business towards the project at the celebration. 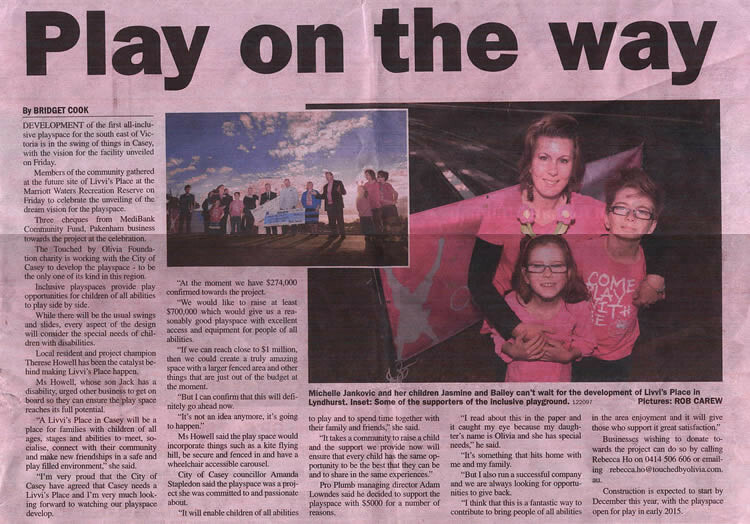 The Touched by Olivia Foundation charity is working with the City of Casey to develop the play space – to be the only one of its kind in this region. Inclusive play spaces provide play opportunities for children of all abilities to play site by side. While there will be the usual swings and slides, every aspect of the design will consider the special needs of children with disabilities. Local resident and project champion Therese Howell has been the catalyst behind making Livvi’s Place happen. Ms Howell, whose son Jack has a disability, urged other business to get on board so they can ensure the play space reaches its full potential. “A Livvi’s Place in Casey will be a place for families with children of all ages, stages and abilities to meet, socialise, connect with their community and make new friendships in a safe and play filled environment,” she said. Ms Howell said the play space would incorporate things such as a kite flying hill, be secure and fenced in and have a wheelchair accessible carousel. City of Casey councillor Amanda Stapledon said the play space was a project she was committed to and passionate about. “It will enable children of all abilities to play and to spend time together with their family and friends,” she said. Pro Plumb managing director Adam Lowndes said he decided to support the play space with $5000 for a number of reasons. “I read about this in the paper and it caught my eye because my daughter’s name is Olivia and she has special needs,” he said. Construction is expected to start by December this year, with the play space open for play in early 2015.